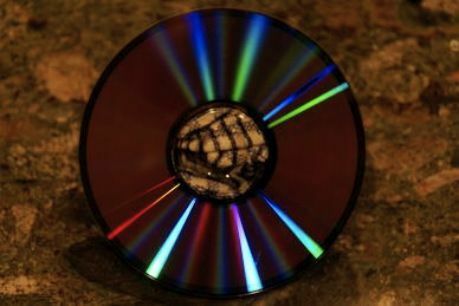 You may have pondered the iridescent reflection on the back of a CD or DVD, but you may not know that light is diffracted by the disc’s grooves. Water waves exhibit diffraction when they encounter obstacles. Waves spread out when slit size is comparable to, or smaller than, the wavelength. 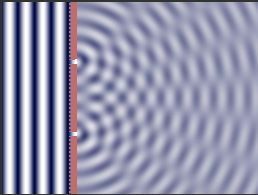 Waves moving out from secondary sources along the slit are in phase when arriving anywhere in the forward direction. 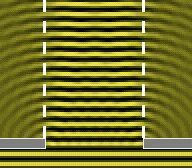 With a small slit, the diffracted wave is curved (left). 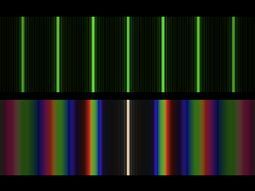 When the slit is much larger than the wavelength (right), the effect of diffraction is less noticeable. When light rays pass through multiple slits, they are diffracted and then interfere constructively and destructively to produce the arrangements as shown above. Diffraction occurs when the conditions in the Bragg equation n =2dsin are satisfied. Diffraction is thus a function of refractive index, wavelength, spacing of the slits, and angle of incidence. Different wavelengths of light are diffracted at different angles, so different colors are seen. 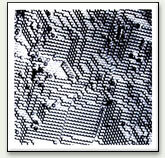 Diffraction is the apparent bending of waves around small obstacles and the spreading out of waves past small openings. Diffraction is a property relating to the wave nature of light. A diffraction grating is an array of thousands of narrow parallel slits or grooves. 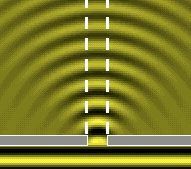 The distance between the slits or grooves is typically close to the wavelength of light. Light rays that pass through a diffraction grating are bent as a result of diffraction. The diffraction angle varies with the wavelength of the light. Light passing through the grating at selected angles is in phase, and constructive interference creates light intensity maxima. As the number of slits increases, the intensity maxima become very sharp and narrow. Diffraction of the light from a distant flashlight viewed through a black umbrella fabric. 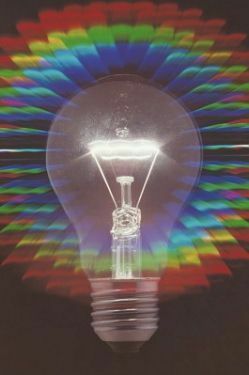 A light bulb viewed through a diffraction grating. This demonstrates that white light is made up of all colors. The grooves of a DVD or CD can act as a diffraction grating and produce iridescent reflections. Opals are unique and individual stones. They are the subject of much folklore, and have been considered lucky in some cultures, and thought of as unlucky in others. The name evolved from the Greek "opallus," which refers to a change in color. Later, the Latin word "opalus" came to mean "precious stone." Opal is formed from silica-bearing waters and can be found inside any type of rock. Throughout the world, silica gel precipitates at low temperatures to form layers or nodules of opal in fissures, veins, and cavities of volcanic and sedimentary rocks. Opal is an amorphous form of silica (SiO2.nH2O), chemically similar to quartz (SiO2), but containing 3% to 21% water within its mineral structure. Opals of gemstone quality usually contain 6% to 10% water. There are three main types of opal. Precious opal is identified by the defining "play of color," or the way in which colors change within a particular stone as it is rotated and tilted. The "fire opal" is a transparent or translucent opal ranging in color from yellow to orange to bright red. Common opal, sometimes called "potch," is usually colorless or white, but the presence of fine-grained impurities may color it gray, brown, yellow, or red. Potch accounts for 80% to 90% of all opal, and has no commercial value. Most of the world’s supply of precious opal comes from the Coober Pedy and Andamooka fields in South Australia. In Roman times, the primary source of opal was an area in what is now eastern Slovakia. Precious opal has also been mined in Honduras, Mexico, and the Virgin Valley in Nevada. The play of color seen in opals is attributed to diffraction. Under suitable conditions, water percolates through the earth. Silicates encountered in the soil dissolve into this water to form a silicate-rich solution. When it enters a cavity, the water deposits the silicates as tiny spheres. The layers of precipitated silica spheres form a jelly-like water mass, sometimes producing a diffraction grating when the spheres are even in size and well ordered. The diffraction grating arrangement creates a play of rainbow sparkling light from within the stone. The play of color is due entirely to the uniformity of tiny spheres, each in the order of a tenth of a micron in diameter. If the spheres are random in shape and arrangement, common opal is formed. If they are uniform in size and shape, they will diffract light and the play of color is evident. The colors caused by the regularly packed spheres making up the internal structure in an opal depend on the size of the spheres and the voids between them. If you move the stone, light hits the spheres from different angles and you perceive a change in color. The size of the spheres has a bearing on the color produced. Smaller spheres (less than about 150 nm) bring out blues and violets from one end of the spectrum. Larger spheres (no larger than about 350 nm) produce oranges and reds. These spheres are so small that this size difference translates to a difference between roughly 3 million "larger" spheres and 6.5 million "smaller" spheres lined up within the space of a millimeter. The more uniform the size of the spheres, the more intense, brilliant, and defined the color will be.